Merrimack has performed for the first time with this new line-up at this year's Party San Open Air. 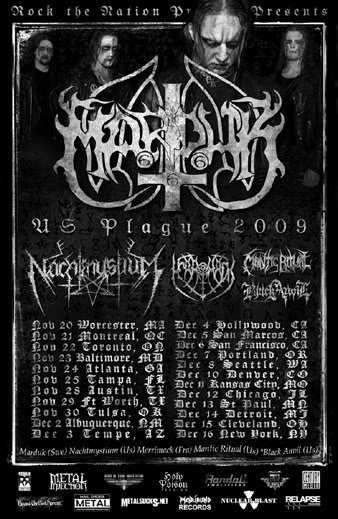 French black metal institution and MORIBUND recording artists MERRIMACK are confirmed as support for the "U.S. Plague Tour 2009," which will feature headliners MARDUK and also NACHTMYSTIUM, MANTIC RITUAL, and on select dates BLACK ANVIL. This tour will be MERRIMACK's first (and highly anticipated) performances on American soil, all in support of new album Grey Rigorism, released just this week in North America by MORIBUND. Says founding guitarist Perversifier, "We're very happy to finally hit American soil and spread the disease of Grey Rigorism there." 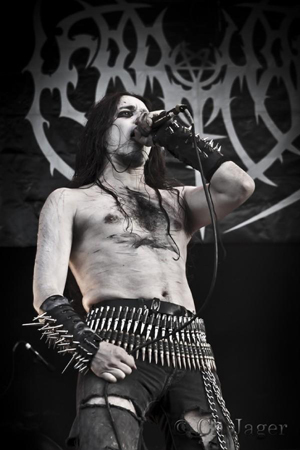 Grey Rigorism is already being hailed by critics as one of the year's very best black metal albums, with the well-respected Decibel even calling it a "hollow-horned masterpiece...with a cold, communicable bitterness few modern-day BM hordes have the ability to convincingly convey." Osmose Productions is proud to announce the european signature with the band Merrimack in co-operation with Moribund records. 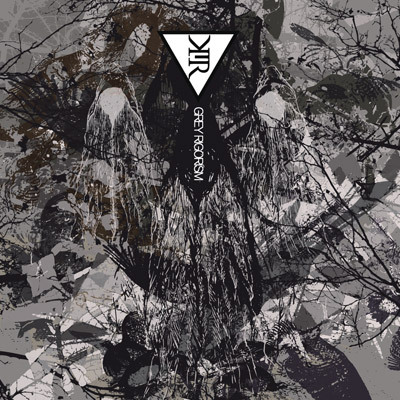 "Grey Rigorism", the coming release is set up for September 15th, 2009. It will be released under regular CD and a limited gatefold double LP. Recorded, mixed and mastered in Necromorbus Studio by Tore Stjerna. Booklet artwork made by Seldon Hunt. Merrimack is pleased to announce the arrival of long time comrade Daethorn to the bass duties, while Terrorizt is back to his vocals position. The band is now open for any touring or gig opportunity. Many more news to come soon. link : http://www.youtube.com/watch?v=bbaVpPvO_58 on youtube. Merrimack will play live at the 10th edition of the Under The Black Sun. 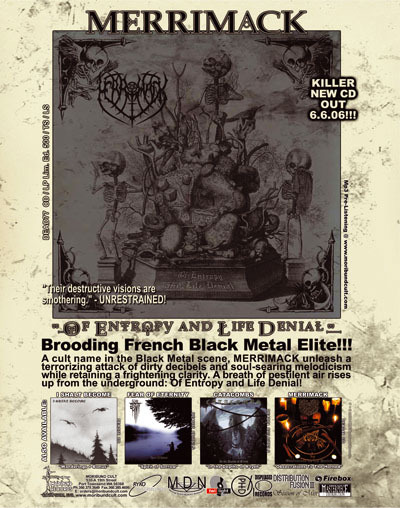 The LP version of Entropy and Life Denial is now out ! 500 gatefold LPs with black/red splatter vinyl. The reedition of Ashes Of Purification CD has also just been released by Nightmare Productions. Check out the Sacrifices section for more infos. “France’s Merrimack has managed to create a depth-ridden campaign of uncomfortable passages affixed to their raw brutality and almost always belligerent sneer. Their destructive visions are smothering” – Unrestrained! Recorded, mixed and mastered in Necromorbus studio. In the meantime, Ashes of Purification will be re-released on CD by Nightmare Productions, with a brand new artwork, and two live tracks : Ashes of Purification, and Seraphic Conspiracy (which will be featured on the new album). This release will be limited to 666 copies. The LP version of Ashes of Purification should finally see the light in the next weeks, after a long delay coming from troubles with the label, Goatowarex. with Corpus Christii and Glorior Belli. are online on the Icons Section. 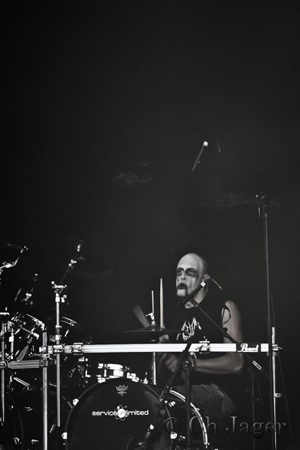 5 tracks have already been composed for the new full lenght album "
", which will be out on Moribund Cult. 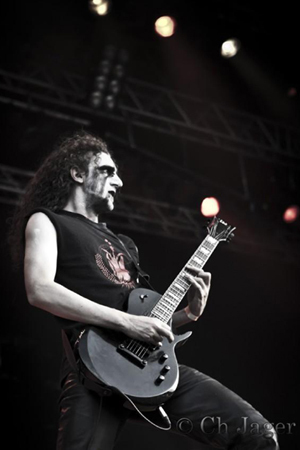 Some discussions are engaged with Elegy Records to repress a special edition of the debut album "Ashes of Purification", including a bonus video. This shouldnt see the light before the release of the new album through Moribund though. The regular LP version of "Ashes of Purification" will be pressed through Goatowarex, Australia, who had already done the picLP version. A total new artwork is being done for this special release.